We have already come to the final day—the final half-day, really—of the 2011 National Conference. 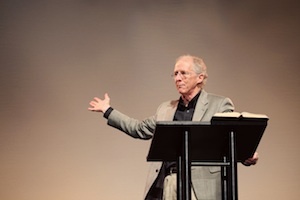 We began the day with a session led by John Piper whose topic was “Let the Nations Be Glad.” He took as his text Psalm 67. Piper began by speaking of the missionary endeavors of the Protestants in England and showing that this burst out of the soil of a rich, Puritan theology. The Puritans lived 150 years before the modern missionary movement that is typically said to begin with William Carey. When 1793 came and with it the birth of the modern missions movement, you had all of these new missionaries driven by the same motives and believing the same Reformed theology. Piper then turned to the modern day and spoke of the global south, showing how at the beginning of the 20th century, Europeans dominated the world church. By the end of the 20th century, the European percentage of world Christianity had shrunk from 70% to 28% of the total while Latin America and Africa combined made 43% of the world’s Christians. But this does not mean that western missions should cease. Far from it! Multitudes of unreached people groups remain and we need to reach them. God has blessed us richly and we are to use these blessings to reach the world with the gospel. What is the great purpose of God revealed in this Psalm? The purpose of God in this Psalm is to be known, praised, enjoyed and feared. Piper pointed out here that there are three kinds of Christians—goers, senders and disobedient. God calls us all to be involved in mission. What is it that God aims to make known about himself among the nations? There are four aims: God aims to be known as the one and only true, living God; God aims to be known as a God of justice; God aims to be known as a God of sovereign power; God aims to be known as a gracious God. Why does God bless his people by making his face shine upon them? So that the Lord’s salvation may reach to the end of the earth. This gospel will be preached as a testimony to all the nations and then the Lord will return. Stay tuned to the blog and in the near future we will have the audio and video of this message available for you.